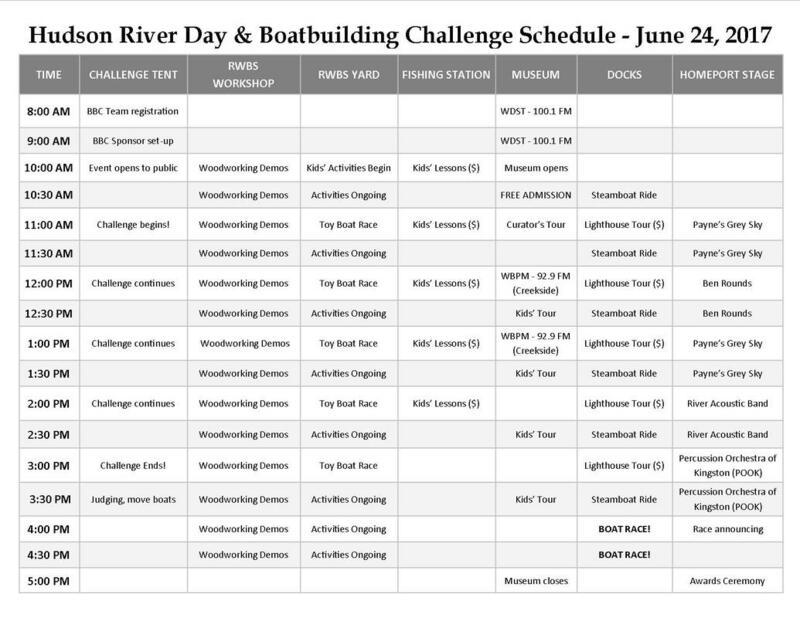 Sponsored in part by the Northeast Woodworker's Association, this activity has kids build and decorate small tugboat-like boats, then race them down a gutter into Rondout Creek. Prizes awarded for the best race times. Kids can spell their name by coloring the corresponding signal flag for each letter of their name and then stringing them in order to create a small banner. 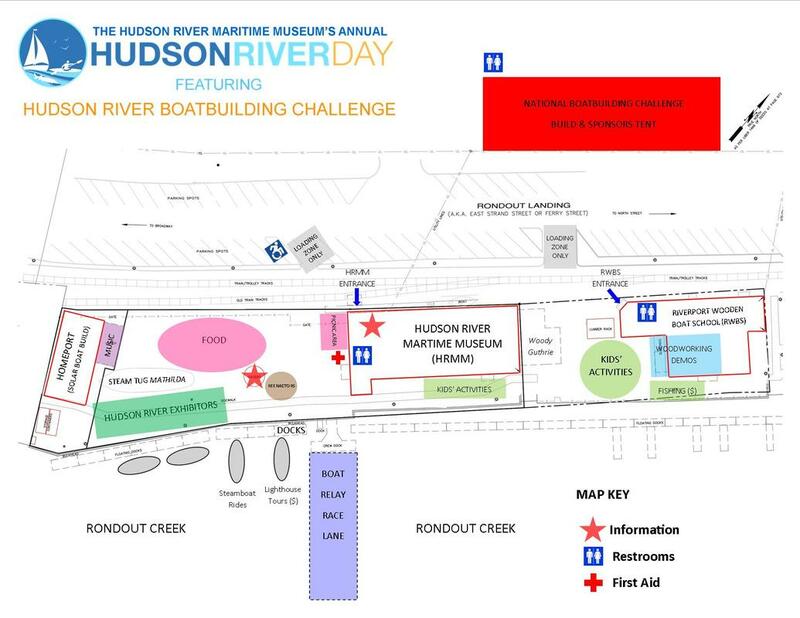 Sponsored by the Hudson River Fishermen's Association, kids can try their hand at fishing and anyone who lands a fish is entered into a contest to win a free fishing pole. Put together your own booklet of coloring pages, word searches, etc. then take it with your, or spend some time coloring. Rondout Lighthouse Tours will be available on Hudson River Day on the above schedule. Each tour can take six people per trip. Tickets are $20 for adults and $12 for kids (HRMM members $17 and $11, must show membership card at time of purchase). Tickets include museum admission and are available for purchase in the museum store. The Rondout Lighthouse was dedicated in 1915 and is the third lighthouse to mark Rondout Creek. It was manned by lighthouse keepers until the 1950s, when it was fully automated. Learn more about the keepers and their families through the decades and make your way to the top of the tower for amazing views of Rondout Creek and the Hudson River while on the tour. Tours leave promptly on the hour from HRMM docks. Take a ride aboard the steam launch Mary Theodora! Tickets are FREE and are available at the HRMM info booth located in the blue gazebo. Tickets are awarded first come, first-served and may be picked up no more than one hour before the ride departs. Tickets are limited to 10 people per ride. Rides are every hour on the half hour starting at 10:30 AM. Last ride is at 3:30 PM. 11:00 AM - Payne's Grey Sky. The seed that eventually became American-roots band, Payne’s Grey Sky, was planted in the summer of 2007 by high school friends Rich Dymond (bass guitar) and Jimi Scheffel (vocals, guitar, harmonica) with Dave Sahloff (drums, percussion) joining the band soon after. Usually performing as a trio, Payne’s Grey Sky’s influences are many- From classics like Dylan, The Band, and Van Morrison to contemporary acts like Wilco, The Head and the Heart and The Avett Brothers. After releasing their debut CD in June 2015, they are now frequently joined by Henry Hermann (violin, viola) and Betsy Scheffel (backing vocals). 1:00 PM - Payne's Grey Sky. The seed that eventually became American-roots band, Payne’s Grey Sky, was planted in the summer of 2007 by high school friends Rich Dymond (bass guitar) and Jimi Scheffel (vocals, guitar, harmonica) with Dave Sahloff (drums, percussion) joining the band soon after. Usually performing as a trio, Payne’s Grey Sky’s influences are many- From classics like Dylan, The Band, and Van Morrison to contemporary acts like Wilco, The Head and the Heart and The Avett Brothers. After releasing their debut CD in June 2015, they are now frequently joined by Henry Hermann (violin, viola) and Betsy Scheffel (backing vocals). 2:00 PM - River Acoustic Band. 3:00 PM - Percussion Orchestra of Kingston (a.k.a. POOK) was founded in 1997 by three professional percussionists with a strong interest in education and youth development. Joakim Lartey, Ruben Quintero and Ev Mann come from three distinct cultural traditions but shared a love of drumming and of working with young people. They each brought a unique style to the group that shaped it profoundly and we are still performing material from that first summer.